Call for Pricing 895 SQ. FT. Call for Pricing 730 SQ. FT. Call for Pricing 855 SQ. FT. Call for Pricing 709 SQ. FT. Call for Pricing 663 SQ. FT. Call for Pricing 580 SQ. FT. Call for Pricing 793 SQ. FT. Call for Pricing 601 SQ. FT. Call for Pricing 692 SQ. FT. Call for Pricing 735 SQ. FT. Call for Pricing 638 SQ. FT. Call for Pricing 760 SQ. FT. Call for Pricing 792 SQ. FT. Call for Pricing 822 SQ. FT. Call for Pricing 888 SQ. FT. Call for Pricing 861 SQ. FT. Call for Pricing 806 SQ. FT. Call for Pricing 1408 SQ. FT. Call for Pricing 997 SQ. FT. Call for Pricing 992 SQ. FT. Call for Pricing 1014 SQ. FT. Call for Pricing 910 SQ. FT. Call for Pricing 1228 SQ. FT. Call for Pricing 1110 SQ. FT. Call for Pricing 1299 SQ. FT. Call for Pricing 1353 SQ. FT. Call for Pricing 988 SQ. FT. Dogs & Cats are welcome. Exotic pets are not permitted. 2 pets per apartment are permitted. There is a $500 pet fee for the 1st pet, plus an additional $300 to add a second pet. Pet rent is $50/pet/mo. The Security Deposit is $200 with approved credit. There is a one-time Amenity Fee of $500, an Application fee of $50/person and a monthly Trash fee of $20. Income must equal 3 times the monthly rent. A credit and criminal background check will be performed. Please check with management for additional details. 2 of your most recent paystubs are acceptable. Please check with management for additional options. Unqualified applicants may seek a guarantor to meet the income guideline. Guarantors are not permitted for any other reason. If roommates apply for an apartment, household income will be combined. Deposits are refundable based on account standing and the condition of the apartment home upon move out. Eligible military members may break their lease. Please check with management for further details. Can I change to a month-to-month lease after my first year? Yes, however, additional fees may be applied. All utilities are paid by the resident. We offer 7-15 month lease terms. 7 months is the shortest lease term we offer. Yes, all residents are required to have renters insurance. Yes, furnished apartments are available for an additional cost, upon request. Yes, corporate apartments are available for an additional cost, upon request. Service requests may be entered online or by visiting the leasing office. Rent is due on the 1st calendar day of each month. Late fees will be applied by the 3rd calendar day of each month. Yes, electronic payments will be available online. Yes, rent may be paid online 24 hours a day. All guests who stay longer than 14 days must be added to the lease. Reserved parking is available for an additional cost. Garage parking is available for an additional cost. Please add all additional occupants to the lease so that they may enjoy the full benefits of the community. Please see management, certain restrictions apply. The building is pre-wired for Verizon Fios & Comcast Xfinity. Yes, the property offers a 24-hour fitness center. The building features a Rooftop Pool & 4 season Sky Lounge. Yes. There is a blue recycling container in every trash room & in loading dock area. No, grills are not permitted. However, all residents are welcome to use the grilling area located on the 9th floor of the building. Yes, storage spaces are available. Yes, 24 hour concierge services will be offered. Specials change daily, please contact management to find out. Can I transfer apartments once I move in? You can change apartments, certain fees may apply. At ZRS, we are committed to reducing our environmental footprint and enhancing our residents’ well-being by developing environmentally sustainable communities. The Beacon Clarendon was designed and constructed to the standards of the Leadership in Energy and Environmental Design (LEED) rating system, a national green building standard developed by the U.S. Green Building Council (USGBC). Our broader neighborhood is a model of sustainable urban mixed-use development – putting you within a few minutes’ walk of work, play, and home. 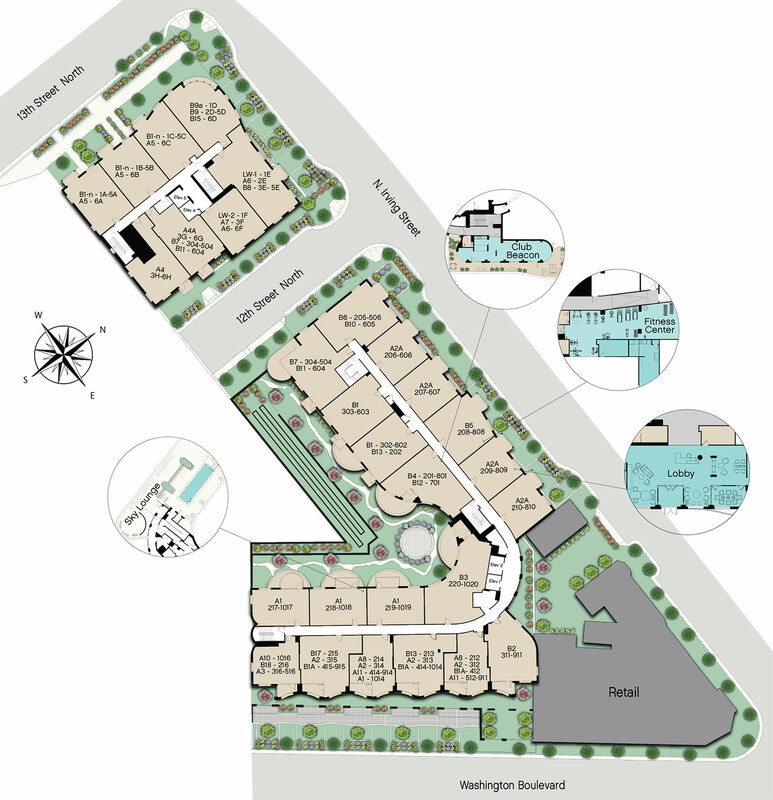 The community will include shops, restaurants, offices, an amphitheater, and connect to bicycle and jogging trails and athletic fields. The Beacon Clarendon has reduced its environmental footprint through the use of energy- and water-efficient equipment and implementation of ongoing sustainable operational practices. By living here, you will pay less for utilities and have the opportunity to live a low-impact, sustainable lifestyle. We use only “green,” non-toxic, biodegradable cleaning products in the building, which are better for the environment and your health. When you decide to move in you will receive a resident handbook outlining simple measures to reduce your environmental impact. Reducing exposure of residents, community staff, and pest management personnel to other potentially hazardous chemicals, we’ve implemented an Integrated Pest Management Program that minimizes the use of pesticides. For all community members’ health and well-being, all our buildings are smoke-free. The Beacon Clarendon’s site selection and environmentally sensitive design were intended to reduce the community’s environmental footprint. During construction, we reduced the strain on local waterways and adverse effects on air quality by preventing and controlling potentially damaging construction pollution. We also used construction materials made from recycled content, reducing the use of limited natural resources. The buildings have green roofs, reducing air conditioning needs and retaining more storm water on site. Green roofs also help mitigate the area’s urban heat island effect, moderating temperatures in the summer months and improving your comfort. The Beacon Clarendon is less than a ten minute walk from two Metro subway stations. All of the community’s parking spaces are located under cover in the parking garage. This preserves open space and minimizes the use of heat-absorbing asphalt. Covered bicycle storage spaces (located in the parking garage) are available to residents, facilitating more convenient alternative commuting and an active, healthy lifestyle. New residents at The Beacon Clarendon are provided with pre-loaded SmarTrip fare cards to encourage use of nearby transit options. The project has a program to encourage residents to utilize a car sharing service. The Beacon Clarendon’s location makes it convenient for you to access what you need. You can easily walk from the property to local stores, businesses, and services. Overall, the project was designed to use 6% less energy and 30% less water than similar communities built to code standards. Here are some of the energy-efficient and water-conserving features of our apartment homes – and how they can translate into real dollar savings on our residents’ utility bills. ENERGY STAR-qualified refrigerators, dishwashers, and washing machines use 20-30% less energy than conventional appliances. Programmable thermostats allow you to scale back heating and cooling during certain hours. Compact fluorescent lights (CFLs) and LED use 75% less energy than standard incandescent lamps. High efficiency water heaters installed in each unit use 4.5% less energy than conventional units. The use of efficient plumbing fixtures will reduce the water consumption in your home by approximately 30%. Highly efficient windows, insulation, and other technologies ensure a tight building envelope. To improve indoor environmental quality, we have used materials with very low potential to emit Volatile Organic Compounds (VOC), reducing the chance of negative health effects such as headaches and allergies. Our buildings were designed to maximize health and comfort. Heating, cooling, and ventilation systems were designed to improve indoor air quality and thermal comfort. Interior spaces were designed to maximize natural light and views to the outdoors. Because of this, there may be enough natural light during the day to avoid having to turn on the lights. The building’s trash rooms contain containers for recycling. Follow I-66 E to N Fairfax Dr and take exit 71. Merge onto N Fairfax Dr and stay on N Fairfax Dr by turning left. Then take another left on N Kirkwood Rd and then turn right onto Washington Blvd. Make a U-turn and then a right onto N Irving St. The Beacon Clarendon will be on the left. Discover the true meaning of luxury at The Beacon Clarendon Downtown Arlington, VA apartments. Offering a variety of unique floor plans including one (with den available), a perfect work from home option, two bedroom, three bedroom options, and even suites, our architecturally inspired community has a home to suit any lifestyle. With our reclaimed textured flooring, stainless steel appliances, and floor-to-ceiling windows, we have achieved a LEED Silver certification for energy efficiency while still maintaining the refined details that you expect to have in luxury Arlington, VA apartments. The Beacon Clarendon is a unique luxury community. Residents of our energy-efficient community of apartments in Downtown Arlington enjoy amenities including concierge services, a rooftop pool, an exclusive fitness center, and a state-of-the-art conference room. With easy access to the Custis Memorial Parkway, the Metro, and a biking station, getting anywhere in the Downtown or D.C. area becomes a breeze. Contact us today to redefine the meaning of Downtown luxury living in Arlington, VA at The Beacon Clarendon.